It may come as no surprise that ‘out with the old and in with the new’ doesn’t apply at the Sackler Library. Contrasting with our previous blog post about the New Books Display, this piece will shed light on how we look after some of the Sackler’s open-shelf collections. 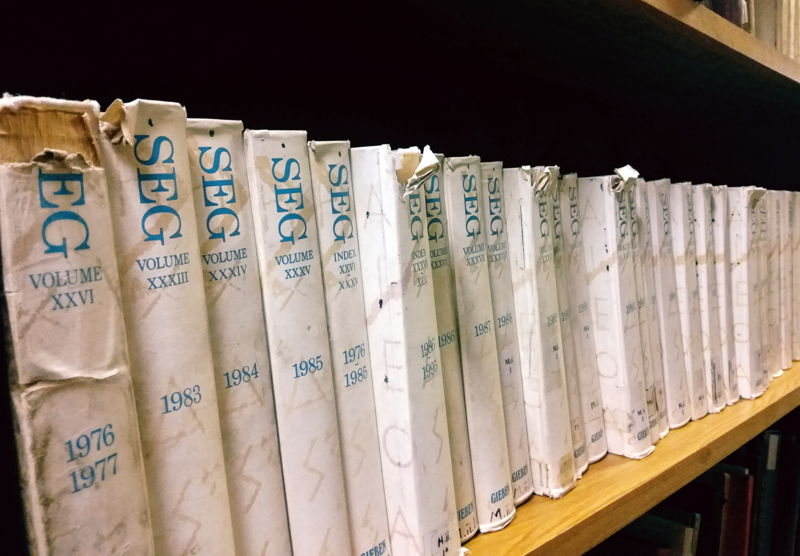 As a busy research library catering to a variety of academic disciplines, it is understandable that some books may be older than others and hence more likely to suffer from wear and tear. The frequent or incorrect use of certain volumes also increases the likelihood of damage, the effects of which can manifest as broken head caps and torn pages. Cracked spines may also result from books being ‘crushed’ open on PCAS machines. To prevent such occurrences, and to protect our material for the future, the Sackler supports established procedures for the safe handling of books. Additionally, a suitable alternative for scanning fragile or oversized items has been made available to all readers. Located on the second floor, our high-resolution overhead scanner allows users to make detailed scans without having to flatten books to an excessive degree. Books with broken head caps. Acknowledging the paucity of available space for new acquisitions, staff at the Sackler are also involved in a ‘Space Creation Project’. One of the project’s aims is to ensure our collections continue to be housed appropriately and don’t become too tightly packed together. This will help minimise the risk of avoidable deterioration like ripped spine covers, which all too readily result from an over-zealous bid to extricate a squashed book. When readers or staff members do identify a book as in need of attention it is temporarily removed from the shelves. This development is duly reflected on the online catalogue (SOLO) which displays a ‘sent for repair’ message below the entry in question. In certain cases a quick fix isn’t an option, so each month we earmark a certain number of volumes to be sent away to a commercial bindery. Here, our books are rebound by a specialist contractor who ensures they come back to the library looking as good as new. We make the most of this important service by selecting some of our high-circulating paperback titles to be rebound as well. Converting student staples to hardback is something we are very keen to do; it increases the shelf-life of books on reading lists and helps us to provide our readers with the publications they need, throughout the year. A selection of rebound titles. 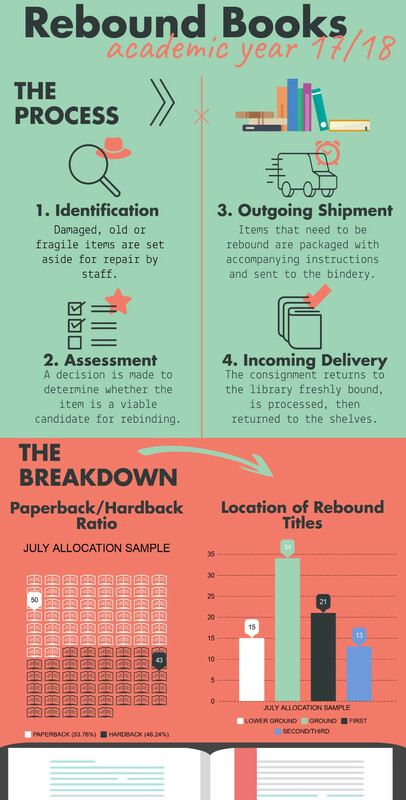 Information and statistics on the rebinding process. The timely replacement of important core texts is another key aspect in our mission to partner readers with resources. 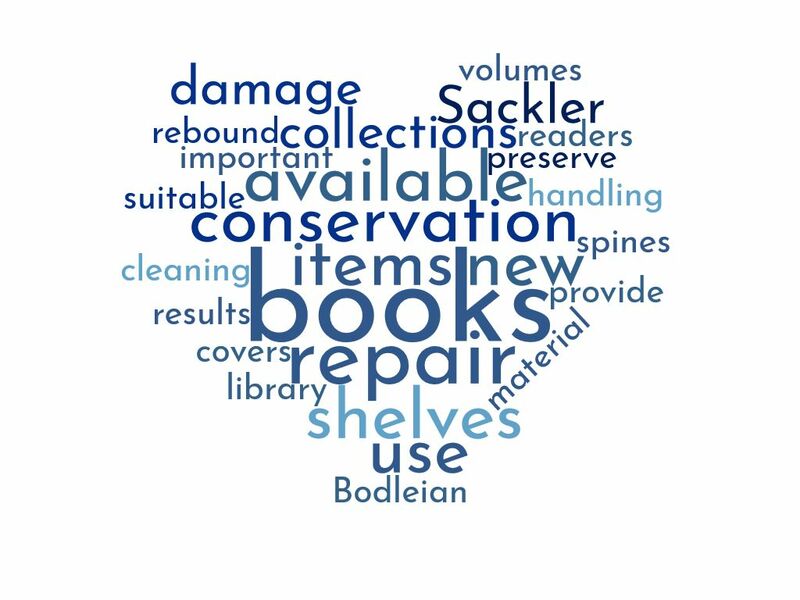 During the routine maintenance and tidying of shelves, Reader-Services staff identify any items that may have fallen into disrepair and liaise with Subject Librarians to ensure a suitable alternative is made available. 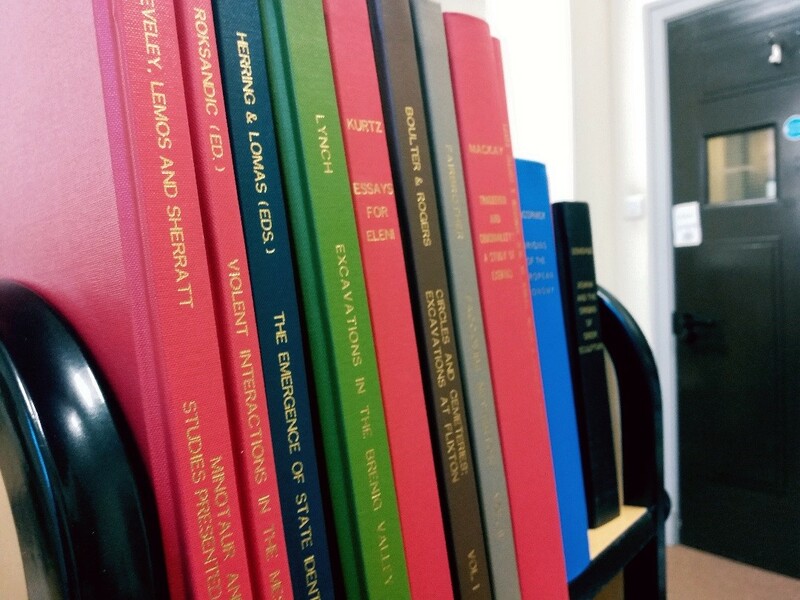 A recent result of this process has been the arrival of some shiny new copies of Liddell and Scott’s Greek-English Lexicon, intended to augment the reference material available to Classicists ahead of the upcoming Michaelmas term. The steps we take to preserve our collections are not just remedial and staff work concurrently behind the scenes to assist in preventative conservation projects like book cleaning. This process centres around the use of a conservation-grade vacuum cleaner with a fine-brush adaptor. With the correct technique this machine lifts dust from the covers and text-block of a book whilst minimising the risk of damage. 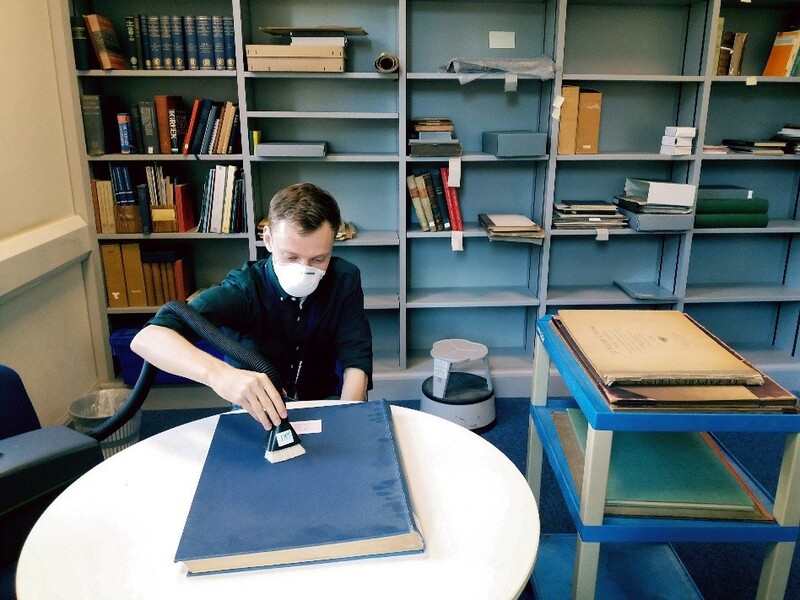 Book cleaning also provides an opportunity to check for pests or mould, and should this yield any concerning results, the Bodleian Conservation team are on-hand to provide appropriate support. Typically, cleaning is done in blocks of no more than two hours to reduce manual handling, so don’t fret if you discover that the item you’re looking for is receiving some TLC ­- it’ll be back on the shelves before you know it!